A Unionist farmer who opposes Brexit has been elected to the Seanad along with a former Fine Gael TD. Ian Marshall topped the poll in a by-election for two vacant seats and was elected on the fourth and final count with his nearest contender Fianna Fáil's Frank O'Flynn some way back. Mr Marshall, a former president of the Ulster Farmers Union, ran as an independent after being first approached by the Taoiseach to contest the election. He was also supported by Sinn Féin. The second seat was won by the former Fine Gael Kildare North TD Anthony Lawlor. Interestingly, Sinn Féin members supported the Fine Gael candidate. A Sinn Féin source said it should come as no surprise that the party would not support the Fianna Fáil leader's candidate given his attacks against Sinn Féin. However many in Leinster House believe local politics also played a role, as Sinn Féin would not have favoured a Fianna Fáil candidate based in Donegal where Sinn Féin is hoping to win back a Dáil seat in the next general election. The elections took place to fill seats left vacant following the resignations of Labour's Denis Landy and Independent Trevor Ó Clochartaigh, who was formerly a Sinn Féin representative. 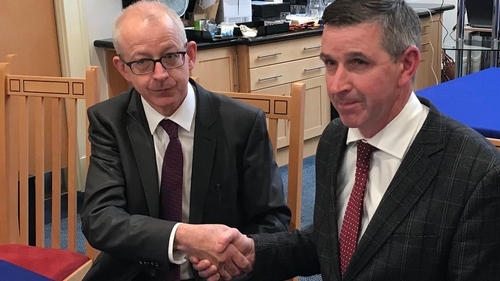 Mr Ó Clochartaigh resigned from the Seanad earlier this year to take up the post of communications manager with TG4, while Mr Landy resigned last November on health grounds.